In the Android Operating System so many terms that can be found, either the section System, Network, and said Gaul. This dipostingan I want to tell you anything just these terms, below are terms that exist in Android that I managed to collect. Acorn Risc Machine (ARM): It is a construction of CPU in use almost every android smartphone. Active Matrix Organic Light Emitting Diode (AMOLED): This type of display on a Smartphone / Tablet Android which displays the image brighter and brighter. Apex: This is a phone for the mid-range segment created by LG for US Cellular products. Apps: term or abbreviation of Applications. App2SD: The term is often used for multiple users android that has a small internal memory Spec, With this method Applications and data can be in the Auto Create stored on SD memory External Micro SD in this case. Android: An Open Source operating system made by Google created for Smartphone or Tablet. Android Market: The place where the entire application can be viewed and downloaded Android officially, now renamed the Android Market Google Play Store. Android Package (APK): Extensions are used to indicate a file for Android Apps. Android Open Source Project (AOSP): A project that opened in General and can be modified in order to obtain the new functionality to make it more stable and usable. Android Virtual Device (AVD): Special Terms for Virtual or Emulator run android on windows. Backup: Make copies of important data, before making modifications to your phone, so if the results are not satisfactory, then the data that has been backed up earlier can be returned to the phone. Benchmark: Test to measure the ability of a cell phone. Usually the speed, the processing of graphics, speed browsing, and more. Beta: Android Operating System Version is still unstable / experimental / not perfect. Bluetooth: Short-range radio made on into smartphones, which allow us to connect headsets, speakerphones or even connect a computer to the smartphone. Bloatware: Default application of carrier (operator) attached to the phone before it is marketed. The determination of an application is bloatware highly subjective, depending on the users assess the application, useful or useless. Bloatware usually appear on phones bundled by a particular operator. Boot: A process turn on the phone. Bootloader: An Internal Mode on Android which in this mode we can do Flashing and go into Recovery Mode. Bootloop: Device to boot continuously (repeatedly) bootanimation trapped, unable to get into the OS. It is by comparing the flashing error or no file system that is not running properly. Brick: A situation where your device failure rooting process. Your device becomes unresponsive and can not be restored. Bricking usually happens when you do not follow instructions carefully rooting. Bricking very rarely happens when you follow the stages of rooting perfectly. Build Number: This is the code that signifies the establishment of the android Firmware on your device. Build.prop: A configuration file that specifies the direction OS Partitioning and some other settings on android OS. Bug: The problems (errors) that occur on the system or application on your phone. Busybox: Applications that provide almost all the commands Linux OS (Android including Linux) in which is already in the package such that it can be in order by several other supporting applications. Typically this app is installed On Android is already in the Root. Cache: Waste stored on Android, this usually produces images and log files. Cache2SD: The process of moving / storing Cache from ROM to SDcard. Clockwork: ClockworkMod developer of the application, this application serves to put the Android Recovery Mode. Cupcake: The name of the Android OS version 1.5. Costum ROM: Modification of the ROM to replace the original ROM of Android. Customize / Customizing: Modding done on FileSystem (FS) mobile phone with the aim customize the phone's display. Usually done to change the look of your phone's menu icons are standard with the new, more attractive. Custom Kernel: Kernel that has been customized or modified by the pebuatnya to obtain specific performance compared Stock kernel. Cross Flash: Flashing a type of phone using Firmware other types of mobile phones have the same specifications with the mobile phone. ClockWorkMod (CWM): Much like Recovery Mode, just that it has many features that are not owned Recovery Mode in general. C/C++: It is a programming language used for Android application library files. Chargermon: File for Boot Menu, which is used for dual boot or to boot into recovery menu, like a boot menu "grub.cfg" in Linux and "boot.ini" in the windows. Charger: Files that are similar to Chargemon, just that is used in the offline charging time. Cyanogen Mod (CWM): Is Android developers who modify the android ROM. Dalvik Cache: Cache that serves to optimize the entire file APK (application) on Android. Deodexed: Changing the application framework, to be able to install themes (such as changing hours, icon, bar), deodex also accelerated applications. Download: Copy files from File System (FS) phone to a computer to be modified or backup. Donut: The name of the Android Operating System Version 1.6. Dynamic Living Network Alliance (DLNA): A method to stream photos and videos wirelessly on our smart phone to the TV. Dalvik Debug Monitor Server (DDMS): An application to explore the running applications on the Android OS, and can also be used as File Manager and display screenshots on Android. Dalvik VM: Part of the Android architecture, is a virtual machine that serves as an Android application runtime between JAVA programming and Library C / C ++. Data2SD: The mechanism automatically move all the data from / data / Internal memory to / data / in the SD Card. Evolution Data Optimized (EVDO): Also known as EV-DO, and 1xEV-DO 1xEVDO is a standard in high speed wireless broADBand. Emergency Download (EDL): EDL mode is used in Qualcomm-based devices for unbricking and flashing purposes. EDL mode bypasses the bootloader, which is why third-party resellers use it to flash vendor ROMs and why users use it to get rid of those. Enhanced Data rates for GSM Evolution (EDGE): A wireless standard that is generally three times greater speed than GPRS. Eclipse: An IDE (Integrated Development Environment) for programming Java-Android. Fastboot: Mode in bootloader that allows you to perform Manual Flash into Android. Firmware: Software that is made by a vendor to operate the phone features, which consists of several smaller parts. File System (FS): Part of the firmware that serves to store configuration files so that the phone can be used as is, also functions as a mobile phone's internal memory. Finalize / finalizing: The last stage in the process of full flashing, the process of copying the configuration files that most major cell phones, along with a certificate Java files to the File System phone, so the phone can be used again after a full flashing. Flashing: Flashing in general is a replacement firmware version, can downgrade or upgrade, depending on availability of the firmware itself. Flashable: File OS (Firmware) .ZIP extension so that flashing can be done through the Recovery Mode. Force Close (FC): How to force him to give up the running applications. This message appears when the application is being crash. Fourth-Generation Technology (4G): This term refers to the commonly used standard fourth generation of mobile phone technology. 4G is the development of 3G and 2G technologies. 4G system provides ultra wide band network for a variety of electronic equipment, such as smart phones and laptop using USB modem. Froyo: The name of the Android OS version 2.2. Factory Reset Protection (FRP): is a new feature to protect SmartPhone devices that use Android OS 5.1 or higher. This security feature allows to set up the device to prevent unauthorized users from accessing or using it. Framework: For example, if we want to edit the status bar, background, etc., we will see data on the Framework. Framework-res: Files used for the theme in the Android system. Full flashing: flashing process is done on the MAIN and File System phones. Full Wide Video Graphics Array (FWVGA): It is the screen resolution of 480 × 854 pixels. Firmware Over the Air (FOTA) / (OTA)):. The process of sending data to the phone firmware or known as Download. Geotagging: Method of recording location. Gingerbread: The name of the Android OS version 2.3. Gmail: free email facilities provided by Google. Google: search engine on the Internet's most popular, which is also often called Giant Technology. Google Now: Assistant app that can help to provide a lot of information that are around you such as location, weather, movie schedules and even schedule your date. Google Wallet: Google facility that serves to connect a credit card, so you can easily spend in the Play Store or other online shopping. Gorilla Glass: This type of glass on some android smartphone or tablet that has a distinctive anti-scratch, anti-heat, and not easy to crack. Global Positioning System (GPS): A device that can detect the presence of you. General Packet Radio Service (GSM): The development of GSM technology to speed data communication up to 115kbps for the GPRS system can be used to transfer the data (in the form of data packets) that are associated with e-mail, image data (MMS), Wireless Application Protocol (WAP ), and the World Wide web (WWW). Graphic Processing Unit (GPU): The graphics processing and the results were shown on the display. Hack (Hacking): Activity modify / change / adjust the system in accordance with the wishes of Android so. Hang: A condition that indicates the phone silent and can not be operated until the battery runs out. Hardbrick: Conditions under which Android can not be revived. Hard Reset: The option to make your Android device back to the original settings / factory with settings and format the entire contents of the Internal and External Memory (SD Card). Half-size Video Graphics Array (HSVGA): It is the screen resolution is 320 × 480 pixels. Handheld (HH): Represents Gadgets, Tablets, Music Player and others. Honeycomb: The name of the Android Operating System version 3.0. This version is intended specifically for Android tablets. Home Screen: Display the first time when the phone is not in use. High-Speed Packet Access (HSPA): Represents the results of the first wave of 3G technology development, Release 99 (R99). So that HSPA is able to work much faster when compared with R99 connection. High Speed Packet Access+ (HSPA+): Sometimes called HSPA Evolution is a standard technology wireless broADBand that will come with the capability of sending data at 42 Mbit / s for downlink by using modulation 64QAM and 11 Mbit / s for uplink modulation 16QAM. High-Speed Downlink Packet Access (HSDPA): It is one of the protocols that improve processes or decrease downlink data from the server to the device (download) at speeds up to 14.4 Mbit / s. While the process of uplink in HSDPA technology up to 384 kbit / s.
Ice Cream Sandwich: The name of the Android Operating System version 4.0. Internet Message Access Protocol (IMAP): Is one to retreive mail protocols other than POP3. International Mobile Equipment Identity (IMEI): Represents the serial number of every device handphoe / tablet. In-Plane switching (IPS): A latest display technology that is more sophisticated than the LCD. Jelly Bean: The name of the version of the Android OS 4.1-4.2. Java: the programming language that is used in Android applications. Just in Time (JIT): Represents the compiler Dalvik on Android, that suppress the memory size, minimize time and get quality seifisien possible. Kernel: As the foundation for the establishment of a Linux system. This kernel is used on Android because Android OS based on Linux. Keyboard: board letters to type. Kitkat: Name of Operating System Version Android 4.4. Launcher: Applications that serves to organize the display of the arrangement of the applications installed on Android. That is the Android launcher looks cool. Linux: Open Source Operating System on which to base the development of the Android OS. Live Wallpapers: Wallpapers can be moving. Long Term Evolution (LTE): A wireless communications standard high-level data access based on GSM / EDGE and UMTS / HSPA. Network interface does not match with 2G and 3G networks, so it must be operated through a separate wireless spectrum. This technology is able to download up to the level of 300Mbps and 75Mbps upload. LTE service was first adopted by mobile operators TeliaSonera in Stockholm and Oslo on 14 December 2009. Link2SD: Mechanism manually move the data in /data/app in the internal memory to an SD card ext2 partition in /data/app. Location Based Systems (LBS): It is a location-based systems, such as foursquare and facebook app on your Android device places. Lollipop: The name of the Android Operating System Version 5.0. Marshmallow: Is the name of the Android operating system version 6.0. MAIN/FLASH: The major part firmware that serves as the Operating System phones that operate the functions of the phone itself. Modding: It is the process of modification of the existing application before. This modification process necessary programming expertise and need specific software to do so. This is not to be done, which most people do is simply install mod existing application only. Dimodif most common application is the application of the system and some applications that already exist in PlayStore. How to install mod application system, please install it from CWM. Media Transfer Protocol (MTP): Designed by Microsoft that serves to make file transfers easier where Android does not need to do so Mouting on External Memory Memory Android is more secure. MTP has become the default file transfer feature for Android OS Jelly Bean and above. Multi Touch: The touch screen feature that allows the screen can capture more than one touch. Nandroid Backup: full system backup is done on the Recovery Mode. If the backup file is restored, the system will return as the last backup settings. Near-field communication (NFC): It has the function of connecting the phone with other devices (mobile phones, instant payment instrument). NFC in Android is now being used in conjunction with Google Wallet as a substitute for a credit card. Nexus: Codename or Name smartphone / tablet that Google issued a pure though Smartphone / tablet was created by other companies. Nougat: Is the name of the Android operating system version 7.0. Oreo: Is the name of the Android operating system version 8.0. Original Equipment Manufacturer (OEM): Represents His term to signify authenticity. Open Source: Software or software that is free or Freesoftware, include the original source code of the software so that it can be developed by other developers. On The Go (OTG): The link between an android device with other devices such as cameras, PCs, USB drive using a USB cable and is usually referred to as USB OTG. Over The Air (OTA): name of the process of downloading or updating apps / Android applications on the system online through an internet connection. Overclock: Create a device to run at a higher speed than the provisions of the device maker. The principle is to create higher performance, but this treatment are at risk of causing stability of the system is reduced until the destruction of computer peripherals that dioveclock. Partial Flashing: flashing process is done only on the MAIN alone, or only at the FS only. Patching: The process of modifying the firmware by replacing a portion of bytes of data that already exists with the new values, with the goal of manipulating the phone system to get the desired results. For example new features, disable a feature that is considered disturbing, and so forth. Personal Identification Number (PIN): This is the security code number. Proximity Sensor: is a sensor capable of detecting the presence of an approaching object without any physical contact. Proximity sensor function on Android will make the phone screen dims / dead when brought near the face to save the battery. QR Code: This is a code-shaped black and white points are random, the code is implicitly a message that can only be read by the Android Phone. Quarter Video Graphics Array (QVGA): It is the screen resolution of 240 × 320 pixels. Random Access Memory (RAM): It is a type of computer storage whose contents can be accessed in a fixed time. Reboot: This is a term to restart the phone. Reset (hard, soft): Was settings reset on Android system in order to return to the original settings. Restore: Restoring data that has been backed-up with the objective of restoring the state as before. Read Only Memory (ROM): On Android there is also a term that means Costum ROM, ROM contains the Operating System that has been in the costume according to the desired setting. Recovery Mode: Mode separate operations that you can run before entering the Android OS system. Recovery mode is intended as a device administrator that serves one of them to replace the ROM on Android. Revolution: Handheld Android with a 4.3-inch screen of LG. Another version of the LG Optimus 2X which is bundled with Verizon. Root (SD card): Base folder (or top level) from an SD card. Often thought of as / sdcard in a file structure. Root: The method to unlock the Android operating system so that users become superuser. By becoming a superuser you can make modifications in the android system. Screenshot: Was the shooting of the phone screen. Software Development Kit (SDK): Is tool for creating software or application to application developers on Android. Sideload: An action to install applications that come from outside the Android Market. Silent Update: Updates are automatically executed without notice (notification) in advance or information is in the process of updating. Soft Brick: brick type that can still be corrected that occurred due to the failure of software such as bootloop or mobile phone can only enter into download mode. Usually lived re-flash the firmware can fix soft-brick. Superuser: If you follow the instructions correctly and successfully in the process of rooting the Android, you will be Superuser (SU), which means you have complete and total access to the Android Operating System. Stock: The new phones purchased are usually present in a state of 'stock' for example: stock ROM, stock Recovery, Stock Firmware, etc. Tegra: NVIDIA Hardware Processor output, for the current processor Tegra be most flattering on the Android devices on the market in 2013. Tethering: is split internet access in Android phones to devices such as cell phone, or laptop either with a USB cable (Wired Tether) or WiFi (Wireless Tethering). TouchWiz: is the front view (user interface) is installed by default on all phones or tablets made by Samsung. Tweak: Facility (utilities) are available on the operating system or process that can optimize the performance of the operating system. Upload: Copying files from the computer to the FS (File System) phones. Update firmware: The process of updating the phone's firmware with the firmware version more actual, with the aim of eliminating bugs in the previous firmware version. Upgrade: Upgrade Android operating system version above. Universal Mobile Telecommunications System (UMTS): One of the 3G mobile phone technology (3rd generation). This is now the most widely used form is the W-CDMA standardized by 3GPP. Unroot: The opposite of the rooting process that returns the access rights to the original android phone and restore to the warranty conditions. If there are applications that require root access, then this application can not run anymore. Under Clock: The opposite of overclock namely reducing the processor speed in which the performance is reduced but the battery becomes more efficient. Underclock also need root conditions. Under Volt: Lowering the processor voltage to modify the source code that is useful to improve battery life. Universal Serial Bus (USB): Usually you get to know her on android USB cable, yes, a cable used to connect your android device to the computer. USB Debugging: A mode that allows you to send commands that exist in the institution of your computer. Vanilla: The term used for mobile phones using the Android OS native (stock) and is not altered by the vendor hp. Examples: Google Nexus. Virtual Private Network (VPN): A private network that allows you to communicate on the Internet anonymously. Wireless Fidelity (Wi-Fi): Often called Wireless Local Area Network (WLAN) is a local network (LAN) is an intermediary through the air and allow you to connect devices without wires. It could also be used as a portal to access the Internet. Widgets: Applications that are placed on the Home Screen with interactive graphics. YouTube: Web-based streaming video from Google. Can be accessed from Android handhelds. 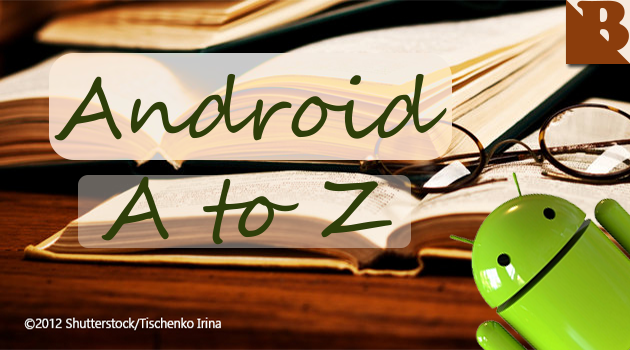 Above are some terms that can be encountered on devices that use the Android Operating System. If you have a new term that does not exist in this post, I appeal to you to display it in the comments field. 0 Response to "Terms On The Android Operating System"